ALL WELCOME. First drink on us! RSVP HERE. 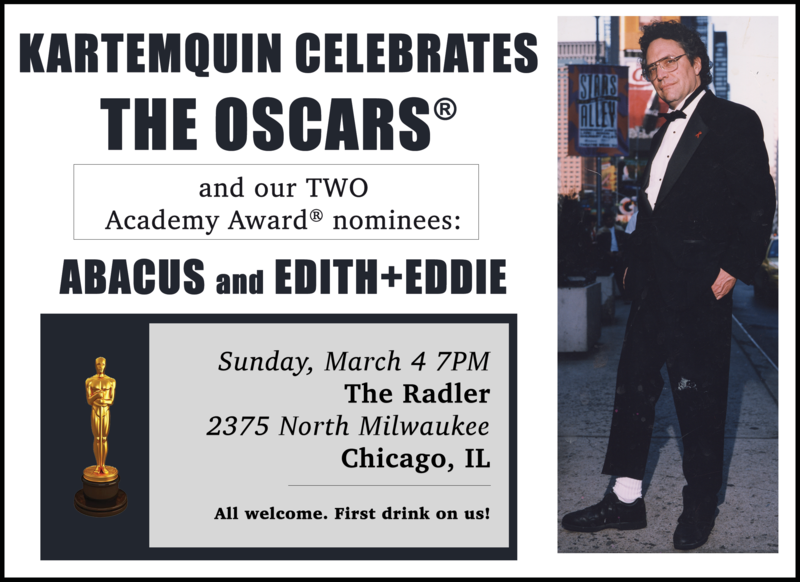 Kartemquin and its historic two nominations were recently profiled in the Chicago Sun-Times, Chicago Tribune, NewCity and RogerEbert.com. "Banter-bickering co-workers and colleagues in an everyday struggle to carve out heart-wrenching, swoon-graced art, yes, about American justice, about humanity, about socioeconomic forces at play, but also voluptuous yet measured cinema: this is consistently transformative nonfiction at its finest. "In their work, there is hope. "And there are also deadlines." Want to see the films before Sunday? Find ways to view Abacus HERE, and ways to view Edith+Eddie HERE. For more information on each respective film, visit abacusmovie.com and editheddie.com.